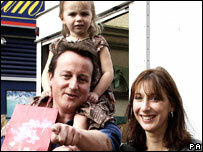 Conservative leader David Cameron has launched his own video weblog to try to get his message across to young people. Webcameron.org.uk looks a little like Youtube and will include regular videos, podcasts and diaries as well as interviews with Mr Cameron and guests. He told a student website the blog was launched because lots of young people "get their news off the internet". As Mr Cameron prepares for his first conference as leader, a poll suggests support for the party is slipping. A YouGov poll for the Daily Telegraph, which questioned 1,847 adults across the UK, suggested the Tory lead over Labour had slipped back. Mr Cameron told the univillage site: "A young person would no more think of going to a public meeting than boiling an egg, so they do it on the internet." He said that via the blog, people could see what he and the Conservative Party were doing, what the policies were and how they were being developed. "They'll see behind the scenes," he said. In one of the first films, the Tory leader is shown outlining his plans for the site while chatting to one of his young children who wants his attention. He explained to univillage: "Lots of young people now don't bother with newspapers - they see that as the dead wood industry and they get their news off the internet. "But we're not really there communicating with them so...I'm launching a totally new idea in British politics." He said he was trying to engage young people and tell them what politicians were trying to do because "we are seen as a race apart". Mr Cameron, who has been accused of lacking substance by political opponents, denied it was a publicity stunt. "It's not a gimmick at all. I'm going to give a lot of time to it," he said. However, the other two main parties have also taken their campaigning to the internet. At the Labour and Lib Dem conferences, political bloggers have been offered computer facilities, background briefings and access to big name politicians. Other internet adventures include a World Cup blog by Tony Blair's former press secretary Alistair Campbell as well as party conference podcasts. The Liberal Democrats' online activity includes flocktogether.org.uk, a site where party members plan meetings and campaigns.